My third Treasure the Teddy is completed. 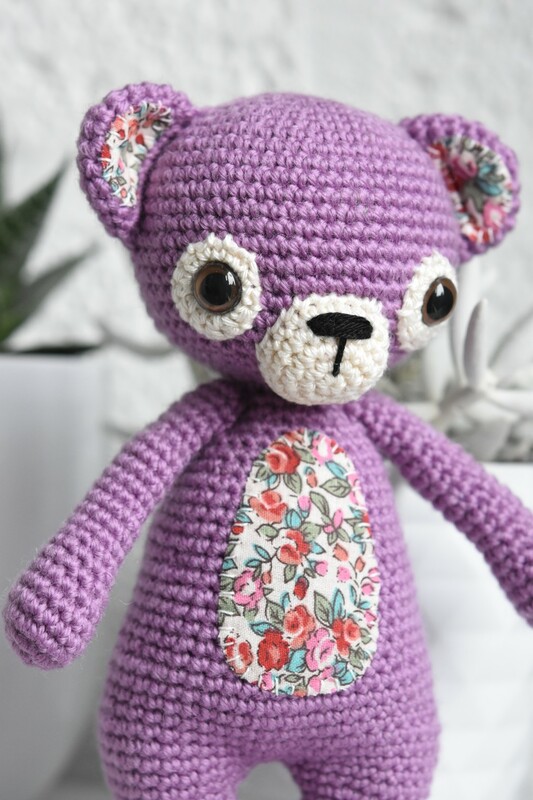 The purple theme wasn`t easy, although I am very pleased with the final outcome. 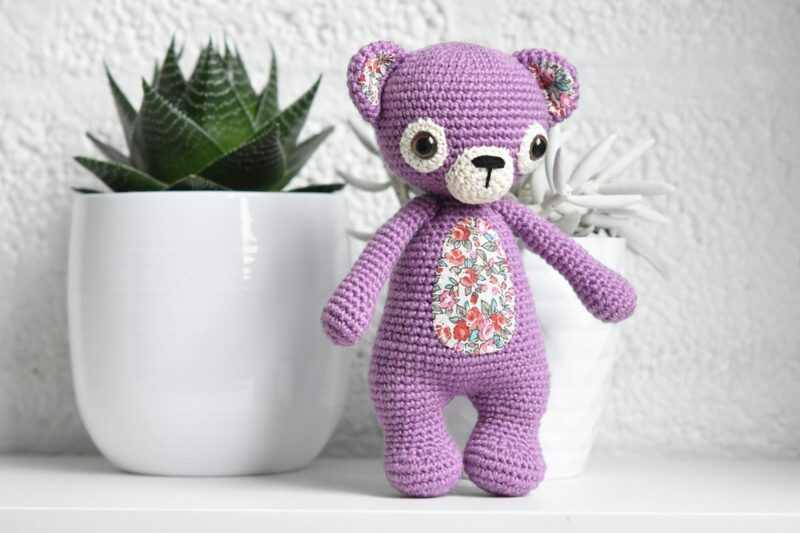 I probably already mentioned one of my goals is not to buy any new yarn during this crochet challenge. So the only purple option I had was this “light old pink” (shade 40) of Drops Karisma. The color wasn`t as deep and rich as I would have wanted, but it was all I got. I spent an entire day finding the perfect combination of fabric and eye patch color, and wondering if I should go for the purple + yellow color scheme or the darker one. And also fighting with the desire to head to the shop and buy some real purple!!! The time spent on planning was totally worth it. Look how pretty she is! 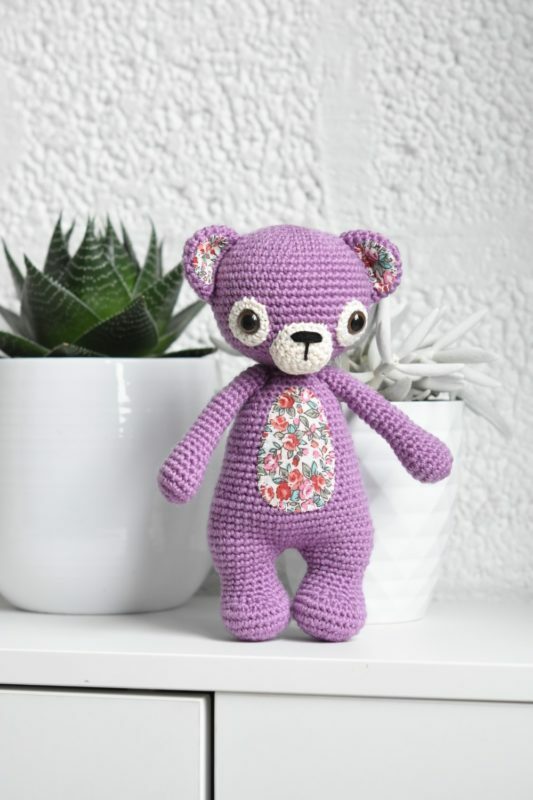 My purple teddy bear has the eye patches and muzzle from the same champagne colored cotton. 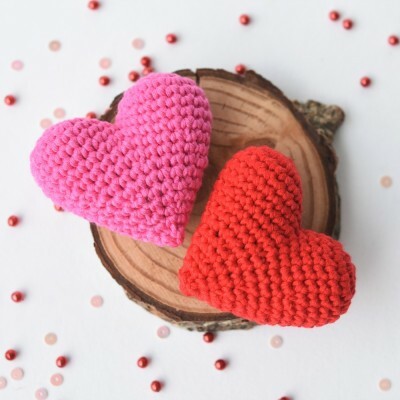 It worked perfectly with the fabric, which has the same colored basis. 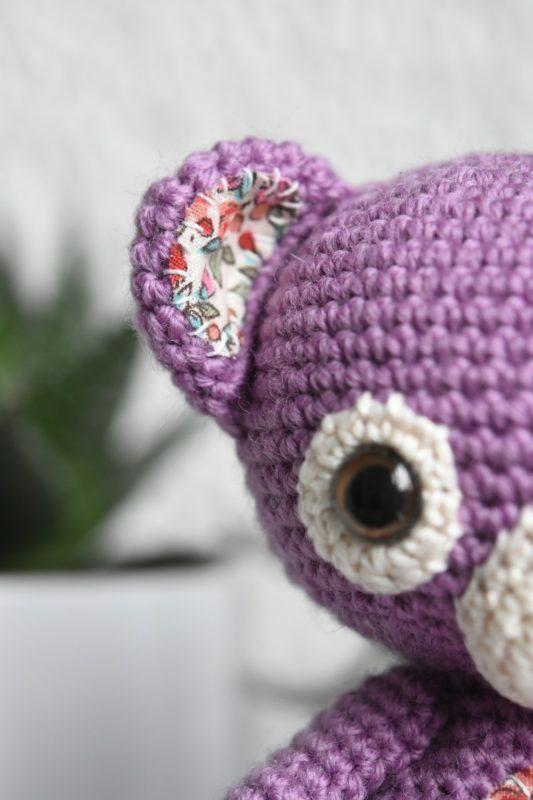 If you haven`t still hesitated to use fabric on your amigurumi toys, then I suggest to watch this tutorial where I talk about the tips I´ve discovered during the years. I think adding the fabric makes the toys unique and gives lots of variety. I am already planning the color scheme for April. Any suggestions? 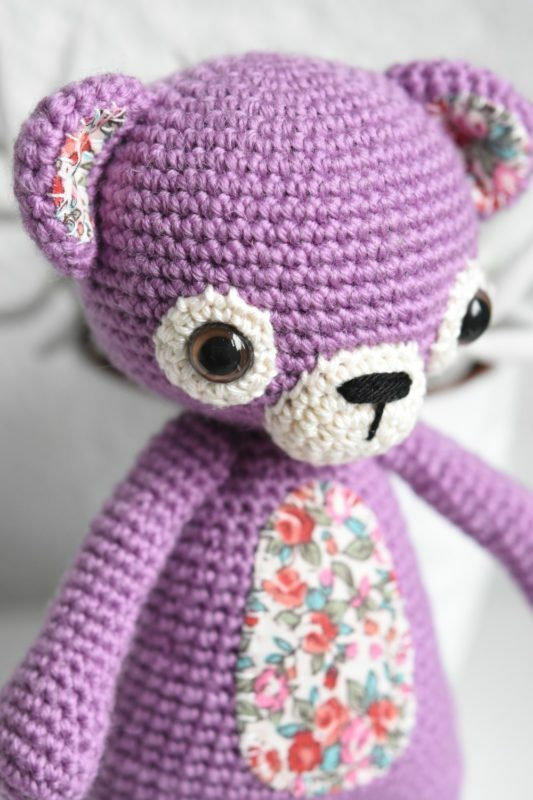 Click here if you want to learn more about Treasure the Teddy crochet challenge. 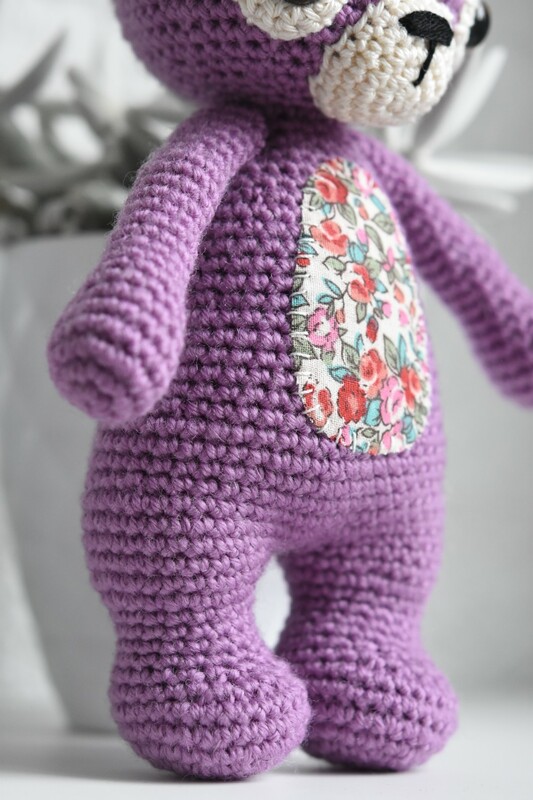 Or browse the gallery to see what kind of teddy bears others have made. 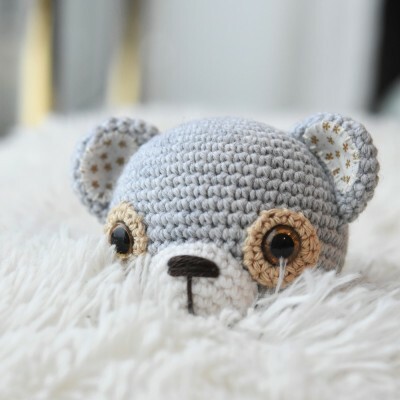 This entry was posted in Amigurumi animals, Bear and tagged Crochet along.